Having only been to California a handful of times, and never long enough to appreciate much outside of an airport, spending some time in Santa Cruz with Royal Enfield made me want drop everything and move to the West Coast. Whether it was the sound of the waves crashing against the rocky cliffs or the spectacular sunset views, it all made sense why Royal Enfield chose this ocean-side location to launch their new twin-cylinders: the Continental GT 650 and Interceptor 650. Emphasizing their history and their attempt to recreate it, Royal Enfield was inspired by their over 117-year heritage, focusing specifically on the motorcycles and café racers of the 1950-60s and the characteristics that made those bikes so popular. According to Royal Enfield Historian Gordon May, California had the greatest number of registered riders in the U.S. in the 1960s, which included hippies, surfers and desert racers. 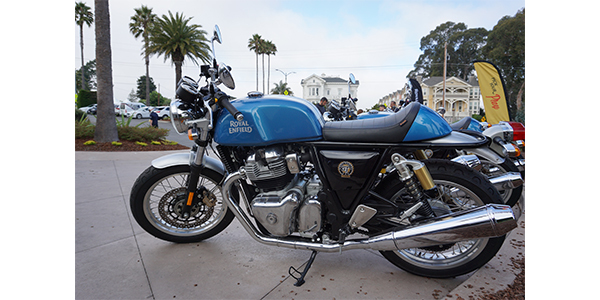 The company embraced the California culture and created the Constellation Scrambler in 1960 and modified it to be the first Interceptor 700 in 1962. The original Continental GT 250 was released in 1964 as the first factory café racer to meet the demands of enthusiasts who modified any bike they could find to become a desert racer. Learning from the “what doesn’t kill you makes you stronger” mantra of the company’s history, the design team at Royal Enfield combined their creative teams and advanced technology to create the Twins. “We didn’t want to create a new 650, we wanted to keep the essence of the 250 but make it accessible for all riders,” said Mark Wells, Head of Global Product Strategy and Industrial Design at Royal Enfield. Wells said that the process to design the Twins was comparable to a camera coming into focus. Both bikes have the same engine, chassis, suspension, exhaust and 18-in. front and rear spoked wheels with custom Pirelli tires. Although both bikes share a classic look, unique ergonomics set the two apart. Immediately comparing the Twins, the GT has clip-on handlebars, rearset foot controls and a humped seat like classic café racers. The INT 650 is an upright motorcycle with foot pegs positioned in line with the rider’s knees and a seat that can comfortably fit two people. The INT gas tank is in a teardrop shape as compared to the GT’s narrow tank that is designed to for knee tucking and built for an angle-forward rider that helps redirect wind when riding on the highway (Pacific Coast Highway, to be exact). One of my favorite aspects of the Twins is the slipper clutch. The ratcheting clutch mechanism reduces wheel lock-up when riding, so you can pound the motorcycle in a single gear and the bike won’t make any unexpected reactions. The slipper clutch creates an extremely predictable ride without any jolts or jumps when in the friction zone. The sound of these motorcycles was the classic burble that is rarely heard on motorcycles today, and it was a relief. Most people are accustomed to screaming, roaring engines, but the Twin’s design from the dual exhausts makes the engine purr like a kitten; a 650cc kitten. The engine was designed with such precision, that I needed to check my tachometer because I couldn’t hear the engine telling me when I needed to shift. As far as the vibration on these bikes, I was expecting to dismount with that shaky feeling after a day on the road, but it didn’t happen. The vibrations were so delicate that I barely noticed the grips and pegs vibrating unless I was really pushing the RPMs. As far as handling and control, these bikes could take a turn and stop on a dime and even dive out of the way safely when a fire truck took over a winding, single-lane Californian road; and yes, I was extremely thankful for the addition of ABS in that situation. As far as pricing, you really get a bang for your buck with the Twins. The INT 650 has an MSRP of $5,799 and the GT starts at $5,999. Bikes increase in price with several different color and chrome options but all come standard with ABS, a three-year warranty and free roadside assistance. Copes mentioned to several members of the press at the launch in September that the company would be introducing two to three new middleweight platforms, which includes engine and chassis pairings, for a total of 12 new motorcycles, in the next three to five years. Looking at the INT and GT, it looks like an exciting future ahead for Royal Enfield.